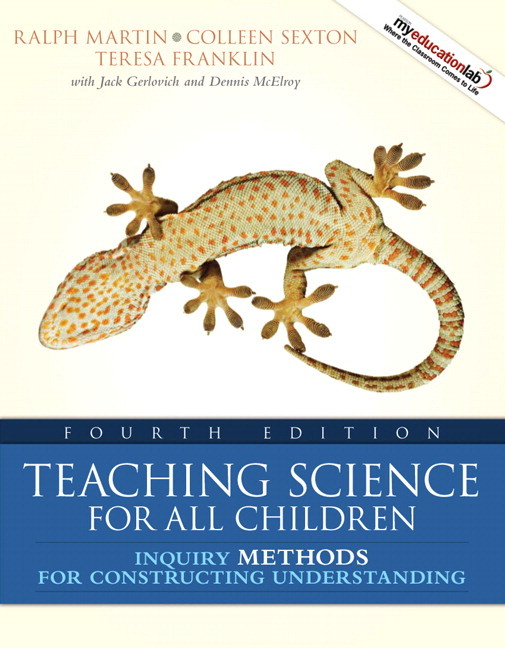 The Fourth Edition of this popular elementary science methods text emphasizes learning science through inquiry, implementation of the Learning Cycle, NSE standards, constructivism, technology, and strategies for teaching diverse learners. This compact version of the larger fifth edition text includes only the methods chapters and omits the content lessons in the back section of the fifth edition book. This methods-only version of Teaching Science for All Children employs an inquiry model throughout, especially apparent in the design of its learning cycle lesson plans. Engaging Questions, Exploration, Explanation, Expansion, and Evaluation make up the “Es” of this modern learning cycle based on the model first invented by Robert Karplus as part of the Science Curriculum Improvement Study in the 1960s. 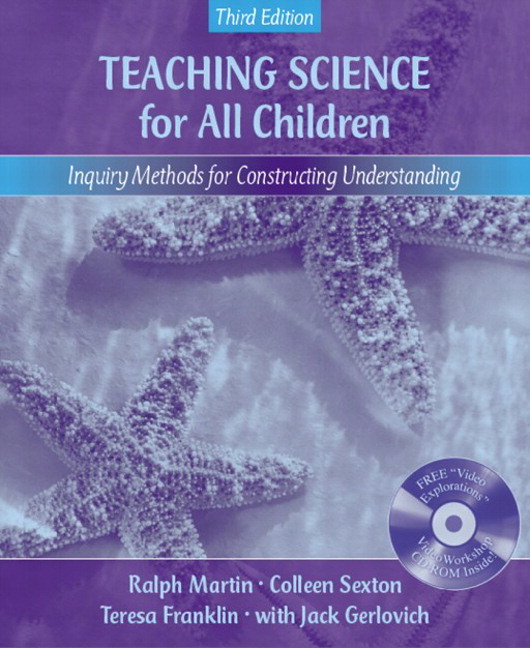 The text provides methods for future teachers to foster awareness and understanding among their students of the nature of science; to construct understandings of and connections between various science content; to encourage application of science inquiry processes in the classroom; and to develop their students’ understanding of the interactions between science, technology, and society. Classroom scenarios at the opening of each chapter give pre-service teachers a window into the elementary science classroom and provide for fruitful discussion in the methods course. “Teachers on Science Teaching” feature boxes allows future teachers to connect with the experienced voices of practicing award-winning science teachers. Twelve detailed science Learning Cycle Featured Lessons encourage hands-on/minds-on activity and high levels of concept formation. All lessons have been classroom tested. Concept maps provide graphic illustrations of the key concepts for each chapter with connections and relationships revealing additional insight about the authors’ thinking and treatment of the topics. Safety and Classroom Design chapter (Ch 10) incorporates the latest research on safety concerns in elementary grades and includes updated safety forms and checklists to guide new teachers to design and manage a safe inquiry-based classroom. Reflect and Respond questions at the end of each chapter encourage readers to think about pertinent issues and prepare for discussion or written response as a part of their continuing professional growth. NSES and NETS icons are conveniently placed in the margin to reveal a clear correlation to the national science and technology standards. Revamped assessment chapter (Ch 7) includes more on the development of learning outcomes and their alignment with assessment and helps teachers see the connection between standardized tests, teacher assessment, and rubric development. Increased discussion of diversity and individual differences integrated throughout the book so that teachers can better meet the needs of today’s students when they enter the classroom. Completely revamped technology chapter now focuses on helping teachers select appropriate resources and incorporate brand new media into science lessons. New Format for Learning Cycle Feature Lesson in each chapter integrates photos and student artifacts that will enhance pre-service teacher’s understanding and applications of the lesson. New 8 ½ X 11 trim size and design allows for better layout of the lessons and improved presentation and readability of chapter contents. 1. Who, What, Why, and How? Things You Want to Know About Our Book. For Whom is This Book Prepared? What Does this Book Strive to Do? Our Beliefs About Learning and Teaching. Beliefs Into Action, A Learning Cycle: Exploration, Explanation, Expansion, and Evaluation. 2. Does Educational Technology Make a Difference? Using Educational Technology to Enrich Your Science Lessons. The National Educational Technology Standards. Why Use Educational Technology? Levels of Use, The Networked Classroom — Removing the Walls. How Can Educational Technology be Applied in the Context of Science Teaching? 3. Lessons for Constructing Understanding. Section I: Life Science Lessons. Section II; Physical Science Lessons. Section III: Earth and Space Science Lessons. National Science Education Standards: Content Standards for K-4 and 5-8. A NSTA Position Statement: Guidelines for Responsible Use of Animals in the Classroom. A NSTA Position Statement: Liability of Teachers for Laboratory Safety and Field Trips. A NSTA Position Statement: Laboratory Science.